Last year, after four years of shooting with Canon, I jumped ship. One of the hardest parts about giving up Canon was the 5D3 that I had been using for over a year prior. I always loved Canon due to being able to control every setting you needed on the fly with just your index finger & thumb, which is what I had missed greatly when I finally picked up my new Nikon gear. The following tips are meant to not only help you maximize efficiency, but to also make your life a bit easier by not having to think so much when you're in high-stress situations. 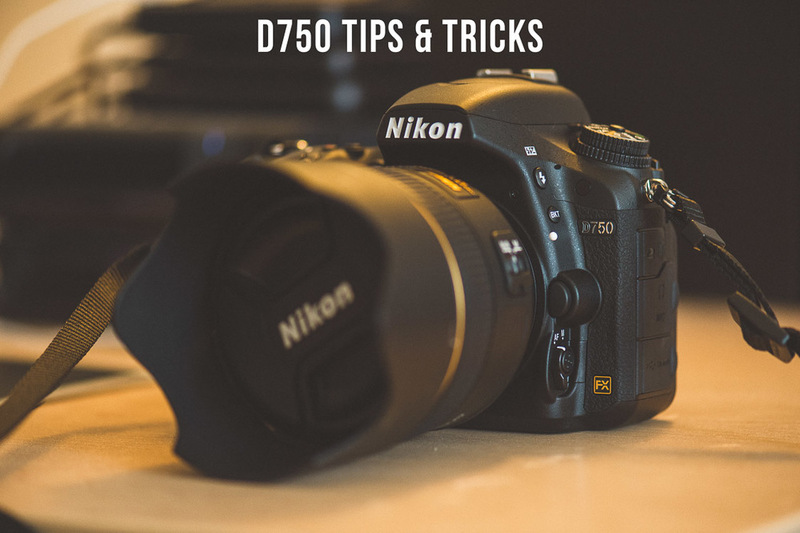 Most of these tips apply to any of Nikon’s latest cameras, including the D4s, D800, D810/e, & the D750, but this post is focused primarily on the features of the D750. Some features may be on Nikon's older models, but these are just the cameras I have used and know for a fact they are implemented in the UI. 1. Switching the movie-record button to control your ISO. This one is a game-changer for those of you that jumped from Canon to Nikon and hated how there wasn’t a way to switch your ISO with your right hand. Do this by simply selecting Menu, Custom Setting Menu (the pencil), Controls, then select “Assign Movie Record Button (f9)” and change it to ISO. 2. Switching the OK button to zoom. This really helps me when I’m on the fly and I need to check if the shot I just took was in focus or if I’m using Live View and I want to zoom in to make tweaks to the focus (with a manual control 45mm tilt-shift, for example). Do this by going to Menu, Custom Setting Menu, Controls, then select “OK Button”, and select both the “Playback Mode” & “Live View” and change them to “Zoom On/Off, 1:1 (100%)”. 4. Easier Image playback. If you came from Canon, you almost certainly miss Canon’s big wheel that lets you zip through your images on the fly. While this doesn’t come anywhere close, it certainly beats having to skip through each image using the multi-selector. This setting enables the main-command dial to scroll through images far more quickly and effortlessly than mindlessly jamming on the arrow buttons to get to the image you want. To set this, go to Menu, Custom Setting Menu, Controls, Customize Command Dials, then turn “Menus and Playback” On. 5. Making sure you can’t take an image without an SD card inserted. This one is common sense and most of you will already have this switched, but it really helps for those of you that may forget to put in a card, shoot some images, and then realize that the images were never taken because you didn’t have any memory inserted. Lock this by going to Menu, Custom Setting Menu, Controls, Slot Empty Release Lock, and turning it to Lock. 1. Focus confirmation beep. One of the simple features that I loved on my 5D3 was the faint beep that let me know whether I focused on something in “One Shot” or not. This helps me tremendously at weddings when I know for a fact my focus locked on before recomposing. If you don’t want to make any noise during the ceremony, simply switching your camera to “Quiet mode” will disable the beep. Change this by going to the Menu, Custom Setting Menu, Shooting/Display, and turning Beep to your preferred volume (I have mine at volume 1 with a low pitch). 2. Switching the self-timer to 2 seconds. The normal default time Nikon’s self-timer is set to is 10 seconds, which in my opinion, is unnecessary in almost every shooting scenario. Switch this by going to Menu, Custom Setting Menu, Timers/AE Lock, and switch “Self-Timer” to 2 or 5 seconds. 3. Turning the annoying AF-assist beam off. This is self-explanatory, folks. Nothing screams unprofessional like beaming your clients in the eyes with your nifty AF-assist beam. Turn this off by going to Menu, Custom Setting Menu, Autofocus, and turning the “Built-In AF-Assist Illuminator” OFF. 4. Storing your AF points by orientation. This setting rocks if you tend to use any of the outer AF points while also switching between landscape & portrait orientation while shooting. It allows you to separately switch your points depending on the orientation you’re holding your camera. Turn this setting on by going to Menu, Custom Setting Menu, Autofocus, and turning “Store Points By Orientation” ON. 2. Highlight-Weighted Metering. * For those of you who don’t know, Nikons ROCK at shadow recovery. With Nikon’s new metering mode, Highlight-Weighted Metering, you’re able to meter perfectly so that you don’t blow any highlights, which is really useful for getting the maximum amount of dynamic range and/or not blowing highlights (like that bride’s beautiful wedding dress). Access this by changing your metering mode to the square with the dot in the middle and an asterisk on the top right corner (picture below). You can read more about this feature on Nikon’s website. *Only available on the D750 + D810. 3. Tilt-screen. This is also very self-explanatory, but this thing rocks in conjunction with live-view. I use this heavily with the 45mm tilt-shift, as it allows me to shoot at whatever level I want and still manual focus like a champ. 1. Choose Image Area. This feature is automatically assigned to the “Fn button” and is great when you’re using primes and need some additional focal length in a hurry. Please note that this is effectively cropping your image in-camera, so you’ll be losing some megapixels, but nothing substantial. For example, if you have on a 58mm lens, you can quickly hold the Fn button down and use the main command dial to select “30x20” or “24x16”, which lets you shoot 1.2x or 1.5x (DX crop mode) respectively. 2. 3D focusing. The concept may be confusing to a handful of you, but it essentially lets you shoot “Center-focus & recompose” style, but with minimal effort and maximum accuracy. Access it by holding down the AF mode button (pictured below), selecting “AF-C” with the main command dial, and then selecting “3D.” From there, you just use the center point to focus, while continuing to half-hold the shutter button. You can move your camera around to recompose, all while Nikon’s sensor tracks what you’ve originally selected and keeps it in focus. 3. Custom Menu. “My Menu” is the last menu option on the left side when scrolling through your menu tabs. This is a great menu to put modes/settings you need quick access to. Mine contains Multiple Exposure, Interval Timer Shooting, White Balance, & ISO. Again, keep in mind that some of these features may not be on your camera, as this is written from the standpoint of the D750. I have also set most of these features up with my D4s, so if you don’t see them in the menu, please shoot me an email and I’ll help you locate what you’re looking for. I hope some of you find these tips helpful, as I personally benefitted from the increased functionality & usability they brought to my cameras. Please keep an eye out for future blog posts about gear, post-processing techniques, and more! You can also connect with me via Facebook, Instagram, & my Facebook Business Page.